Jackpot City Casino is an absolutely enormous casino, offering over 400 different games to their members (including about 35 different blackjack variations!). 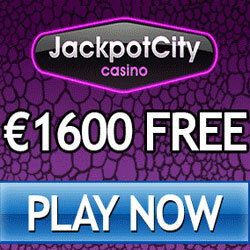 Even the instant play casino has over 150 games on offer. The promotions are strong, and the 2-part loyalty program, in which players earn both regular and auction points, is excellent. These features and more make Jackpot City an excellent casino. 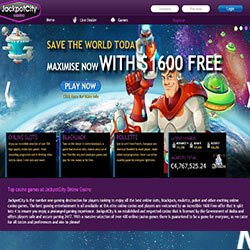 JackpotCityCasino is yet another great Microgaming casino. They are responsible for making the downloadable software suite that powers the main casino. It is overflowing with 400+ games, but since you only have to download the games you really want to play, it is quick to get the base software and install it. There is also an instant play version of the casino, offering 150 games from the downloadable version. The biggest advantage to playing the instant version of the casino is it does not need to be installed, so you can play wherever you can get online! The number of different blackjack variations available to members of Jackpot City Casino is simply mind-boggling. All the popular styles are here – from Vegas Strip and Atlantic City to Triple 7’s and Super Fun 21. 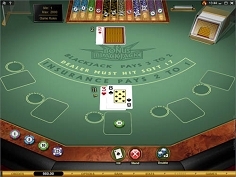 Many of the games are Gold Series games, with high-resolution graphics and digital sound effects, like Multihand Pontoon Gold and Double Exposure Blackjack Gold. With this much variety, you’ll be able to find the perfect blackjack game to suit your playing style. For a break from blackjack, take a look at the other 365 games they offer – that’s one new game for every day of the year! With this much variety, you will never be bored again. From the usual huge selection of slots and video poker games, all the way through a mass of table and card classics, and down to unique games like keno and scratch cards – this casino has it all. They even have a small selection of fruit machine slots that some players just go crazy over! There are two startup bonuses to take advantage of at JackpotCity. First, you get 100% up to €200 when you sign up. Any winnings over €20 and up to €200 are yours to keep. The second bonus is a 100% match up to €300 on your first deposit. Both are great bonuses, but blackjack games count only 10% towards the playthrough requirements, so either skip out on them, or play other games until you can make a withdrawal. The loyalty program here is very impressive too – for every point you earn, you get an auction point too, that you can use to bid on great stuff! 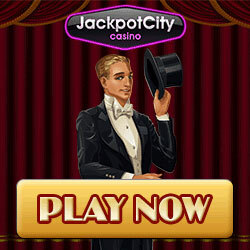 Jackpot City Casino is aptly named, as it a true metropolis of games that offer a lot of money to be won. The casino has a huge selection of blackjack and other games, and some strong bonuses to help players keep their accounts full. The loyalty program is excellent as well. In all, our impression of JackpotCity was very good, and we think it is going to grow into one of the web’s more popular gaming sites.